State of the art strain gauge technology allows for accuracy to 1/10 ounce over a working range of 0 to 12 pounds. The Digital Trigger Pull Gauge is equipped with a large, easy to read LCD display and is push button operated for zero, clear and averaging functions. It can also can be converted to read in kilograms. Unlike other gauges, there are no weights or sliding pointers to worry about. Simply place the gauge on the trigger and pull! 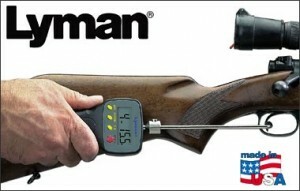 Lyman’s Digital Trigger Pull Gauge accurately records the results. You can also take multiple readings and the Digital Trigger Pull Gauge will tell you the average weight for the string. This is the perfect tool for target shooters, silhouette shooters, gunsmiths, hunters or anyone who wants to adjust their trigger pull weights accurately and easily. Lyman’s trigger-pull gauge arrives packed in a small zippered pouch that is padded for protection. Each component is strapped in with Velcro straps and there is a small pocket to store a 9v battery that is not supplied. The trigger-pull gauge comes with an “L” shaped removable pull-rod with a roller on the end. The rod is about 5″ long with a 2-inch “finger” where the roller is attached and attaches to the gauge simply by threading it all the way into the end of the gauge and tightening the locking nut. Then twist the rod as necessary to set the direction of the finger. Safety is king… Please make sure your firearm is not loaded and it is safe to test fire, whether that be with or without a hammer-block device or snap loads. Once the rod is connected and the finger is facing the right direction and your firearm is cocked and safe to test fire, you are ready to test the trigger-pull. Position the roller on the trigger and align the gauge in a direction where you can pull in a smooth and consistent manner just until the trigger releases the hammer. Whenever possible use a gun vise to secure the firearm. It will make things go much easier for you. Holding the firearm while pulling on the test gauge can be more than a little awkward, especially with a long rifle. Additionally, on firearms with hinged triggers and trigger safeties, you must take care to properly set the roller and pull angle to obtain an accurate reading. Learning to operate the trigger-pull gauge accurately takes a little patience and practice. I found that holding the gauge at 90˚, the rod and finger were best-aligned for consistent trigger-pulling. To get the most accurate reading out of your gauge, it is best to take at least 3 readings and as many as 10, then use the Average feature to display the combined results. Although Lyman’s Digital Trigger-Pull Gauge is a little pricey at around $50, I found it invaluable for accurately testing (and averaging) my triggers. The only negative I found is related to the roller itself. The small roller supplied with the unit does not always contact enough of the trigger’s surface to release the safety with some a hinged-trigger assemblies. Simply providing a larger roller with the unit would better accommodate the many trigger variations. I have seen user-modifications out there, but larger factory-supplied roller would be a better choice to solve this minor problem. “Brands That Perform” means something here at Lyman. Performance means more than just getting the job done. It means delivering value while advancing technology. Most important it means listening to the needs of shooters. In fact, the development of our products is most often directly linked to the feedback we get from our customers and the retailers who supply them. Whether pioneering the use of digital technology in reloading tools or reintroducing “antique” calibers and bullet moulds, Lyman continues to improve and innovate the tools used by serious shooters and reloaders.